Comics and architecture have more in common than it might seem at first glance, given that both are about creating living environments to be read and experienced in story and reality. So it is somewhat surprising that so few German-language comics deal with the subject of architecture compared to other places and languages, such the architectural comics of Belgians François Schuiten and Benoît Peeters from and US-American comic artist David Mazzucchelli, and the architecturally complex spaces created by Frenchman Marc-Antoine Mathieu. 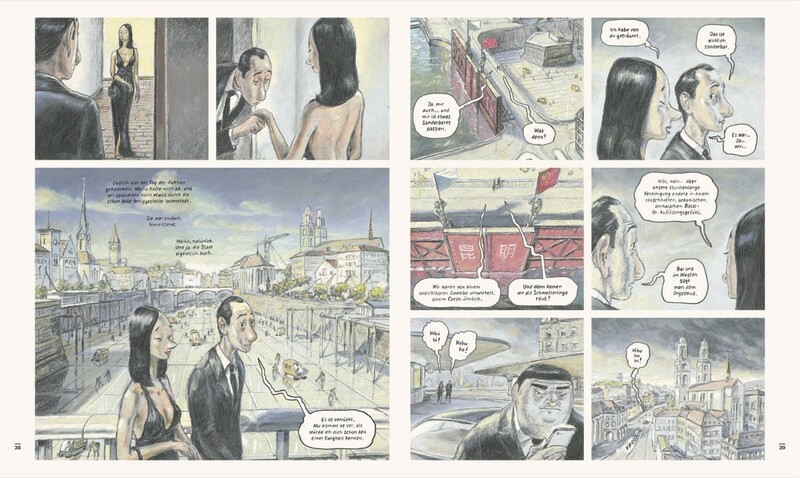 In this sense, Matthias Gnehm is a pioneer in the German-language comic world. Unlike Schuiten and Peeters, however, the Zurich-based author does not explore parallel urban worlds and the destruction of historical buildings, choosing instead to focus on architecture as a social space and its role in creating identity formation. One topic that is particularly close to Gnehm’s heart is urban sprawl in his Swiss homeland, a topic he explores in Die Bekehrung (The Conversion) from 2011. After a quarter of a century away, an architecture journalist travels back to the village of his childhood and remembers a previously repressed, dark chapter of his youth. In the train, he recalls and relives how he, his friends and his secret love were victimized by an evangelical preacher. Once there, he sees that the once so pastoral and straightforward village of his childhood has grown crowded and been engulfed by an urban agglomeration. The urban sprawl has resulted in locational and social alienation among the inhabitants, just as his childhood experience alienated him from his parents and his origins. The story is set in Gnehm’s home in the Swiss midlands, where he was born in 1970 and spent his childhood. In the 1960s, it was the site of a prestigious urban planning project developed by Gnehm’s future alma mater, ETH Zurich. The project failed miserably and was unable to prevent urban sprawl in the area. In Gnehm’s comic, village’s disintegrating social space becomes symbolic of how the villagers, and especially the children, feel: lost and adrift. In Die kopierte Stadt (The Copied City, 2014), Gnehm deals with another architectural phenomenon involving an unusual form of architectural appropriation: the faithful reproduction of buildings and even entire districts. Failed, naive architect Leo Lander visits Hans Romer, a friend from university, in the city of Kunming in southern China and becomes a pawn in a nefarious scheme. Romer runs a successful architectural firm that is building a copy of the city of Zurich in China for a real estate mogul. Classical European architecture is a real trend in China today, where entire European urban districts and famous structures are being recreated in the suburbs. Die kopierte Stadt explores the difference between a copy and the original, a distinction much more important in Europe than in Asian cultures, which plunges protagonist Lander into deep despair. Ultimately Lander ends up commuting back and forth between Switzerland and China, living in the same space in the original and the replica Zurich, the very same apartment with the same furniture, and loses all sense of reality. Matthias Gnehm is an extraordinary comic artist, and not only because he reflects on architectural and social issues. He also develops a new narrative form and drawing style for each piece. Such as in Der Maler der ewigen Portraitgalerie (Eternal Portrait Gallery Painter, 2013), which has a very interesting backstory. 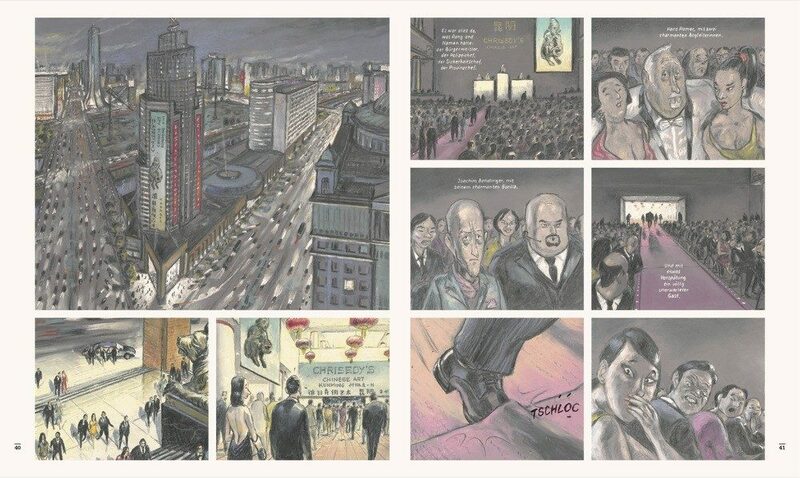 Gnehm began by exhibiting six four-centimetre pastel portraits in black and white in a Zurich gallery and launching a comic book project on a corresponding website. For a fee, he offered to draw visitors’ portraits in the same fashion. Gnehm asked people to submit a photograph to serve as a model drew a portrait and uploaded it the website. Subjects received the original drawing and a promise that their portrait would appear in his upcoming graphic novel. An unconventional way to finance an unconventional comic book some might not even call a comic, as the 250-page work has no panels or speech bubbles. Each page features up to four images in portrait format with text below or on one side. The narrative tells the tale of an unsuccessful painter who discovers a tiny portrait of his grandmother among her photographs. He sets out in search of his family’s roots, and he uncovers a well-kept secret buried in his family’s history. 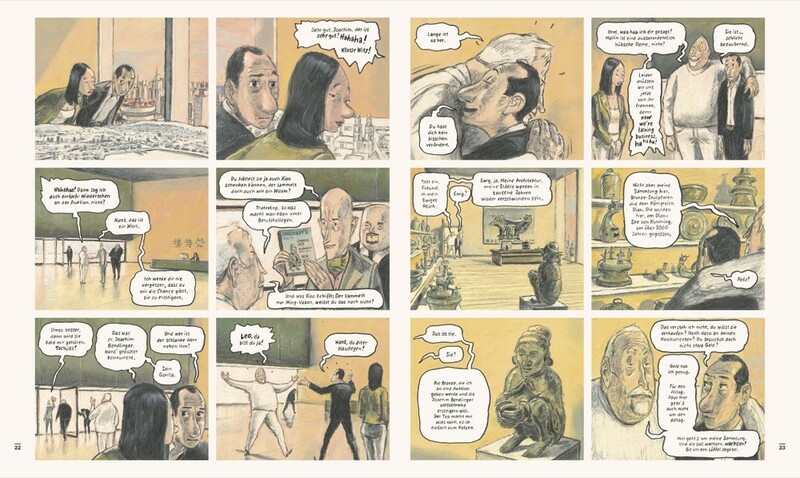 In an earlier comic, Das Selbstexperiment (The Self-Experiment, 2008), Gnehm delivers a fast-paced thriller that - like Die kopierte Stadt - is actually about reality and consciousness. As he works to find a cure for jealousy, researcher Frank Karrer accidently discovers how human consciousness functions and develops. When he tests these findings on himself, the experiment goes terribly wrong and Karrer is lost in a consciousness not his own. Through scientific excursions and fantastic speculations, Gnehm condenses highly complex scientific questions from research into consciousness and emotion into a breath-taking thriller that also touches on philosophical questions. “Die kopierte Stadt” (The Copied City) by Matthias Gnehm.